Several of the previous chapters on interactions have included a section on mathematical models. This is perhaps a good time to remind ourselves why this was - because the models, by separating essence from detail, were able to provide insights that would not be apparent from a catalog of actual examples. For modeling to be a success, then, it is imperative that the 'essence' is correctly identified. What is the essence of a mutualism? One might imagine it to be that each partner has a positive influence on the fitness of the other partner. At first sight, therefore, we might imagine that an appropriate model for a mutualistic interaction would simply replace the negative contributions in models of two-species competition (see Chapter 8) with positive contributions. However, such a model leads to absurd solutions in which both populations explode to unlimited size (May, 1981) because it places no limits on the carrying capacity of either species, which would therefore increase indefinitely. In practice, intraspecific competition for limiting resources must eventually determine a maximum carrying capacity for any mutualist population, even if the population of the partner mutualist is present in excess (Dean, 1983). Thus, a plant whose growth is limited by a shortage of fixed nitrogen may be released into faster growth by mutualism with a nitrogen-fixing partner, but its faster growth must soon become constrained by a shortage of some other limiting resource (e.g. water, phosphate, radiant energy). This returns us to points made at the start of the chapter: that the essence of mutualism is subtler than 'mutual benefit'. Rather, instead of thinking of each partner as a benefit to the other, without qualification, it is better to think of each partner exploiting the other, with benefits to be gained but also costs to pay. And to recognize, too, that the balance of benefits and costs can alter - with changing conditions, changing resource levels, the abundance of either partner, and the presence or abundance of other species. Even the simplest of models, therefore, would have to have terms not signifying a 'positive contribution', but terms that could be positive or negative according to the state of some other part of the model community: not simple at all compared to the models described, and found useful, in previous chapters. In a sense, then, turning to models does prove helpful at this point. Models of predator-prey and competitor pairs in isolation capture an essence of predator-prey and competitive interactions. The fact that models of isolated pairs of 'mutualists' cannot do so re-emphasizes that mutualism is, in terms of population dynamics, essentially an interaction that should only be viewed within the broader context of a larger community. We have seen this earlier in the chapter, for example in ants and aphids in the presence and absence of aphid predators, in Symbiodinium taxa coexisting in coral, and in the legume-Rhizobium mutualism, which brings its great advantage to the legume when it is competing with some other plant (e.g. a grass) for limited nitrogen from the soil. 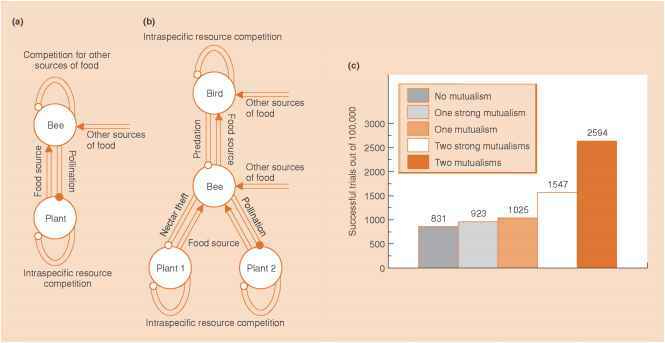 This point has been captured in a mathematical model, in which a two-species bee-plant pollination mutualism (Figure 13.22a) was examined embedded in a community that also contained another species of plant and a species of bird that preyed on the bees (Figure 13.22b) (Ringel et al., 1996). The bees could either take nectar and pollen from the plants but fail to pollinate them (predator-prey) or could pollinate them successfully (mutualistic). The model of the simple mutualistic pair (Figure 13.22a) was, as described above, intrinsically unstable. The pair could only persist if the strength of intraspecific competition exceeded that of mutualism: the more mutualistic the interaction became, the more unstable it was. Taken at face value, such results seem to suggest that mutualisms will be rare (though we have seen they are not), since the conditions for their existence are restricted. 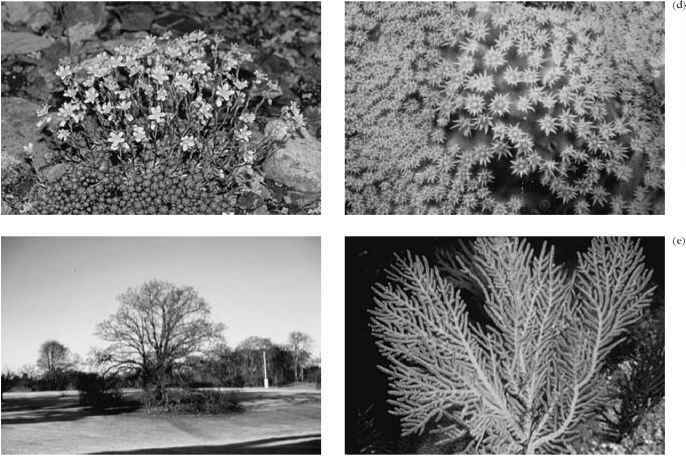 A quite different picture emerges, however, once the pair is embedded in the larger assemblage (Figure 13.22b). Using a variety of measures, one of which is illustrated and explained in Figure 13.22c, it was apparent that mutualisms tended to increase the chances of the assemblage's persistence. Clearly, there is no necessary paradox between the widespread occurrence of mutualistic interactions in nature and their effects in model assemblages of species. Equally clearly, though, while model assemblages are inevitably simple (e.g. just five species), the effects of mutualistic interactions in nature can easily be misjudged if they are too simple (i.e. the mutualistic pair alone).